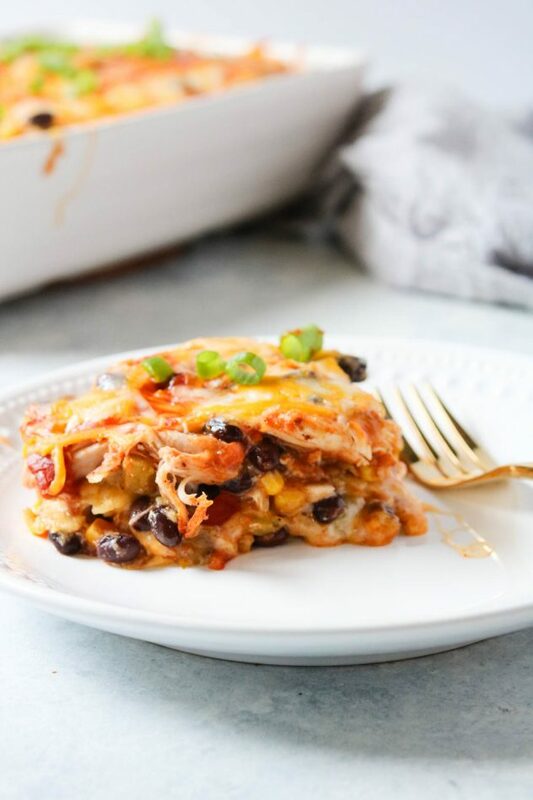 If you’re looking for a super fast dinner, this chicken enchilada casserole is exactly what you need! You spoke and I listened! A few weeks ago on my Facebook page, I asked my readers what types of recipes they’d like to see on the blog. The overwhelming majority wanted quick dinners and casseroles. 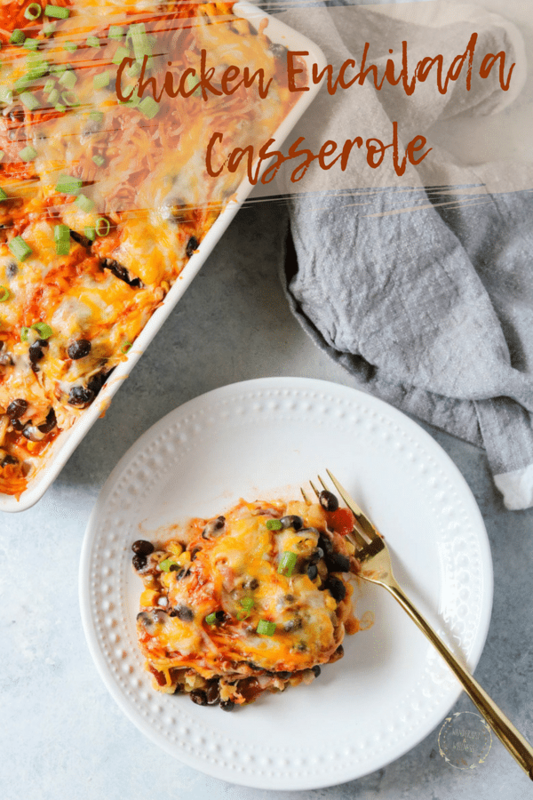 Now, while you won’t probably see a ton of traditional “casseroles”, I definitely plan to incorporate more dinners that are quick and easy. The mission of Wanderlust and Wellness is to bring friends and families back to the kitchen table one recipe at a time. 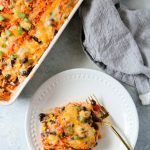 If quick dinners will help your family reconnect at dinner time, then let’s do this, starting with this chicken enchilada casserole! Oh, and my readers also wanted to see more “in process” shots of the recipe in development, so I’ll be incorporating more of those into each post when I can. 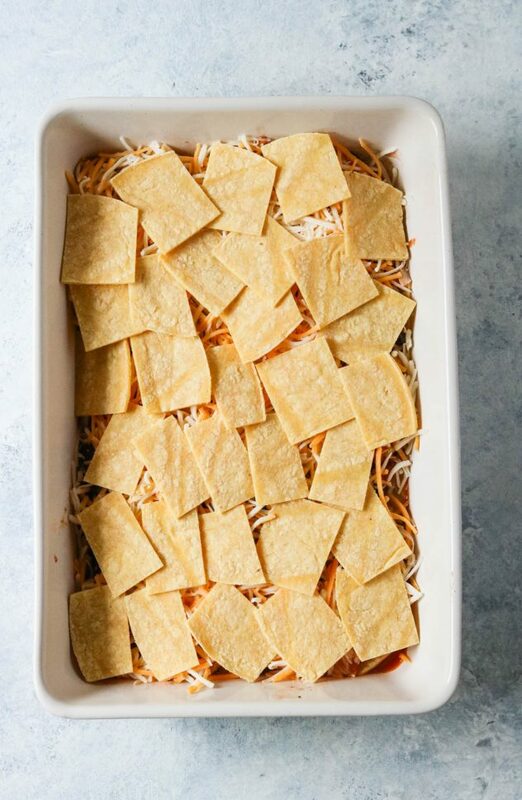 After you combine all of the filling ingredients, you’ll begin to layer the casserole. 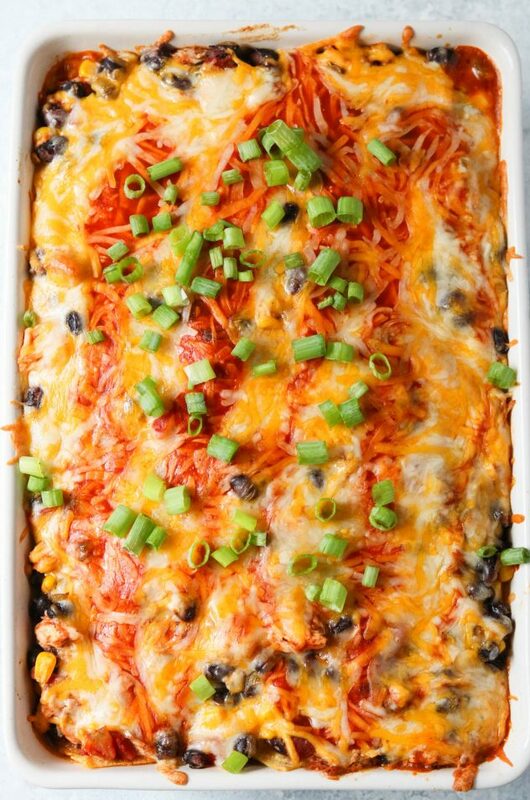 In a 9×13 baking dish, you’ll first grease the dish then add a thin layer of enchilada sauce. From there, you’ll do a layer of corn tortilla pieces, the filling mixture, and shredded Mexican cheese blend. You’ll repeat this three times and then top it off with a little additional enchilada sauce. You’ll cut the corn tortillas into small squares, which makes it easy to serve. After you’ve finished all of the layers, you’ll bake uncovered for 20 minutes. After you remove the chicken enchilada casserole from the oven, top with some chopped green onions and serve. Also, as with most of my recipes, don’t be afraid to make this your own! Add jalapeños for some heat, or black olives if that’s your thing. Get creative and make it your own! I’ll talk about this more in my upcoming cookbook this Autumn, but I think we’ve become so afraid of “messing up” in the kitchen that we fear experimentation and customizing recipes to our own twist. We’ve overcomplicated cooking for whatever reason, so let’s work to uncomplicate cooking, shall we? 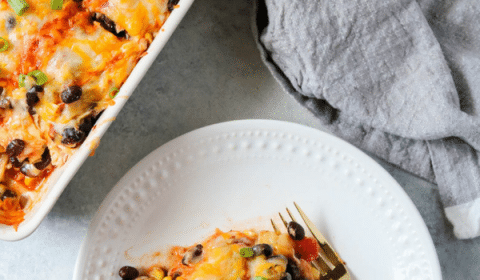 One thing I really love about this chicken enchilada casserole is that it holds its shape! 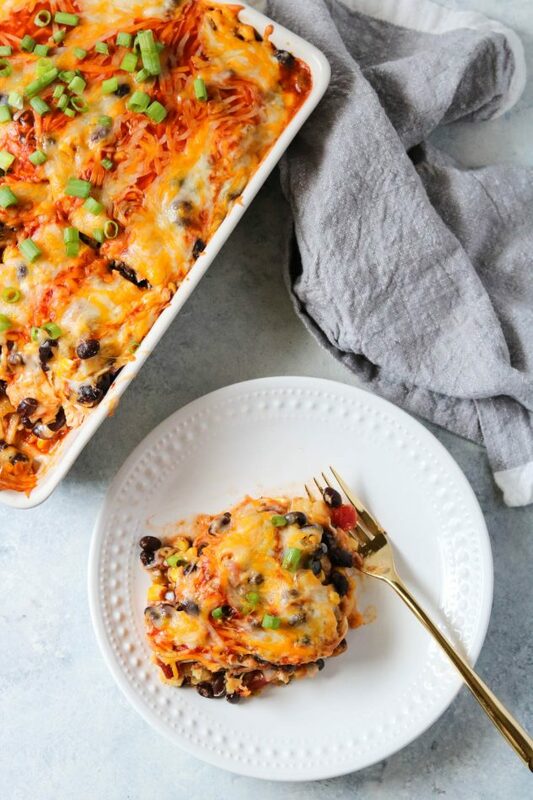 How many times do you make a casserole and when you serve it on your plate it just melts into a pile of mush? Not this casserole! You can see the layers in this photo, so many great flavors in those layers! Grease a 9×13 baking dish. Reserve 1 cup of the enchilada sauce. Add the two cans of black beans and 1 can of corn to a colander and rinse. Transfer to a large mixing bowl. Add the green chiles, chopped onion, Rotel, cumin, salt, pepper, and remaining enchilada sauce to the bowl and stir to combine. Using your hands, remove the chicken meat from the rotisserie chicken, shredding it into small chunks. 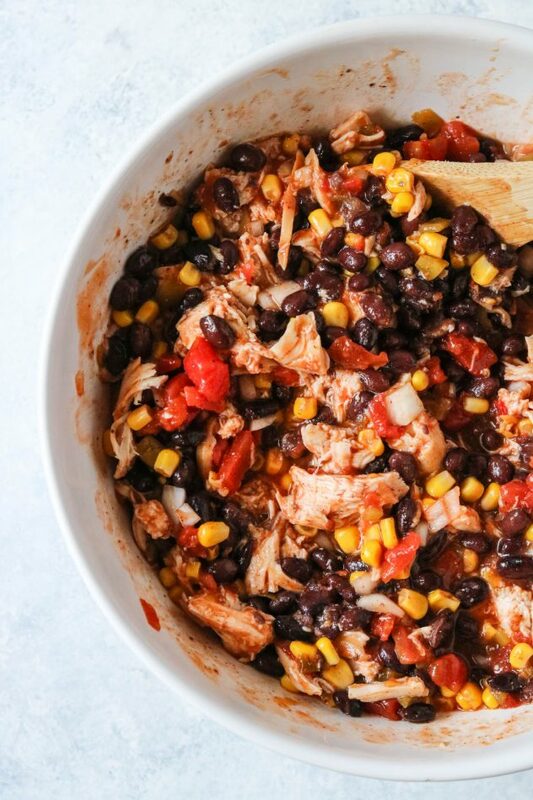 Add the chicken to the mixing bowl with the other filling ingredients as you shred it. Once all the chicken has been shredded and added to the bowl, stir to combine. Using a knife, cut the 12 corn tortillas into small squares. Begin assembling the casserole. Pour 1/2 cup of the reserved enchilada sauce into the baking dish. Then, using a spoon, spread the sauce to cover the entire bottom of the dish. Next, add a layer of the corn tortilla pieces, then a layer of the filling mixture, followed by a layer of shredded cheese (about 1/3 of the cheese). From there, add another layer of tortillas, then filling mixture, then another 1/3 of the cheese. Lastly, add another layer of tortilla pieces, followed by the filling mixture, and the remaining shredded cheese. Pour the remaining 1/2 cup of enchilada sauce over the top layer of cheese. Place the dish into the oven and bake for 20 minutes. Once finished, garnish with the chopped green onions and serve.